Yamaha's DSP-AX759SE landed on our test bench with a lot to live up to: its predecessor bagged a Gold Award in our Awards Issue last year. Even a cursory look over the new unit reveals that Yamaha is working on an "if it ain't broke, don't fix it" philosophy. The '759SE is a UK-tuned design. 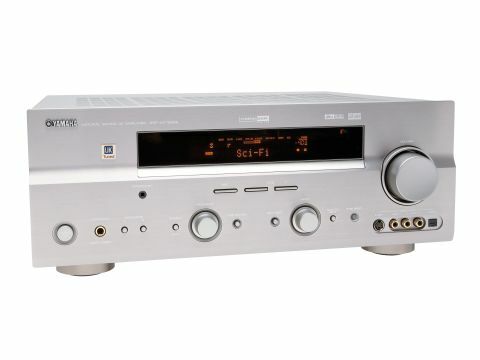 It covers all the AV decoding formats you could need, boasts a claimed 100 watts for seven channels, Yamaha's Top-ART amplifiers and the YPAO auto-set up and equaliser circuitry. Don't expect frills like HDMI switching, but it's a lot of amp for £500. The improvements over last year's model are aimed at further enhancing its sonic abilities. The power supply has been upgraded, the DACs are now highly respected Burr-Brown 192kHz/24-Bit devices and there has been a complete re-mapping of the internal wiring and circuits to shorten signal paths, further improve S/N ratio and reduce cross talk. Set-up is about as basic as the genre gets. Sadly, you can't engage the auto set-up routine without the 'Yamaha Parametric Room Acoustic Optimizer' (YPAO) implementing its thing too. The YPAO system here is a basic parametric filtering network, and there is little in the way of fine tuning to be had over the YPAO's filtering post-op, so it's usually best left switched out. Cutting to the chase, last year's Award-winning sound has matured nicely, gaining more grace and charm with a wider range of material. It's a smooth sound, far more subtle and refined than any of its competitors at this price, with bass that is tight and dry. Compared to its peers, which generally offer portly and gung-ho low frequency reproduction, the Yamaha is a little lightweight, but its bass is fast and tuneful and has far better resolution of individual tones. Yamaha has made much of its Pure Direct mode, which shuts down all video processing and display functions to leave only the analogue stages powered-up. The benefit is an immediate and tangible reduction in high frequency hash and that brings a subjective increase in the airiness of the soundstage. Relative to its class-leading musical performance, some home cinema buffs might find the '759SE's home cinema performance a tad disappointing. It lacks the clout of some compitors, and can sound a little bit soft and lightweight with high-octane movie material. However, more subtle soundtracks revel in the Yamaha's smooth and refined character, allowing fine detail to shine through.